The Mariners know 2019 will be rough. So do we. But a tantalizing future isn’t far off. All spring, we’ve heard optimistic speculation about how good the Mariners are going to be in the future. What we haven’t heard much about is how good — or bad — they are going to be in the present. There is, after all, a season to play, one with official statistics and everything. And while the Mariners are pointing toward some indeterminate point in 2020 or 2021 when they expect their master rebuilding plan to coalesce, they will also be putting tickets on sale in 2019. Suffice it to say, the Mariners will be picked last in the AL West in almost everyone’s preseason assessment, despite winning 89 games last year. That’s completely warranted when you dump three All-Stars (Nelson Cruz, Jean Segura, Edwin Diaz), plus your staff ace (James Paxton), plus your best overall player (Robinson Cano), plus other various and sundry veteran pieces. They got lots of cool prospects in those trades, but they’ll be toiling this year mostly in Tacoma, Little Rock, Modesto and Charleston. The team that will be playing at T-Mobile Park (nee Safeco Field) will be a hodgepodge of rising (they hope) young players and place-holding older veterans. It’s group that may not have many holdovers if and when the breakout comes. The Westgate Las Vegas Supewr Book in February put Seattle’s over-under for victories at 70.5, one behind the Texas Rangers (and 26 behind the Houston Astros). Sounds about right to me. To translate, 70.5 wins means 91.5 losses. So it will be a rough year for the Mariners. We knew that. They knew that. It doesn’t mean it won’t be an interesting year, at least. The Mariners have had plenty of 90-loss seasons during their 17-year playoff drought that were stultifying, deadly dull, and made all the worse because they were actually trying hard to win. At least there’s clarity of purpose here. That’s not to say the Mariners of the moment won’t be putting forth full effort on the field. It’s just a tacit acknowledgment that the organization didn’t put full effort into fielding their most competitive club in 2019. That’s the whole strategy of a step back. The lineup is interesting. I’m curious to see if Mitch Haniger can take the next step to stardom. I’m curious if Dee Gordon will be rejuvenated at the more comfortable position of second base (and if he’ll realize that walks are not toxic). I’m curious to see if a svelte Kyle Seager can once again be a productive Kyle Seager (once his finger injury heals). I’m curious to see if Mallex Smith (once his arm injury heals) can be the answer at leadoff. I’m curious to see if Daniel Vogelbach can actually be a productive major-leaguer if given consistent at-bats. But the stark reality of the 2019 Mariners is that the guys I’m going to be watching most closely are Kyle Lewis, Jarred Kelenic, Evan White, Shed Long, J.P. Crawford and Julio Rodriguez, not to mention Justus Sheffield, Justin Dunn, Sam Carlson and Logan Gilbert. Not a one of them will start the year in Seattle (though a few might end there). And, conversely, many of those who do start in Seattle probably won’t end there (such as Edwin Encarnacion, Jay Bruce, Mike Leake and Hunter Strickland). So it will be a hard team for fans to give over their hearts to. You might want to save that commitment for the flip-flop. The ideal scenario for this Mariners team would be to gather momentum as the season progresses, finish strong as the transition to younger foundational player occurs, and end the year riding a wave of hope and momentum. Pretty much the opposite of last year, in other words. It’s possible to believe in the Mariners’ master plan — and I do see reasons for optimism, especially after sizing up their top prospects in person this spring — and still recognize that it’s likely to be a struggle in 2019. The defense stacks up as subpar, particularly while Seager and Smith are recovering. Only Gordon can be rated as a plus defender at his position (an equation that will change when Haniger goes back to right field). The bullpen is wildly inexperienced — the 10 relievers who went to Japan had a combined 25 career saves among them, less than half of Diaz’s total from last year alone. Though you never know exactly how a bullpen will come together, it figures to be a major problem area. The rotation is also a big question mark, particularly in the back end, where Felix Hernandez is jarringly listed as the No. 5 starter. The Mariners will be watching most closely to see if Marco Gonzales and Yusei Kuchichi, the keepers from this group, make the requisite progress. The operative phrase to keep in mind regarding the 2019 Mariners is “work in progress.” That’s a baseball euphemism for “rough air ahead, please fasten your seat belts.” But maybe they’ll hit their cruising altitude by the All-Star break as the next wave of talent is introduced. That’s the dream. Sore today, soar tomorrow. 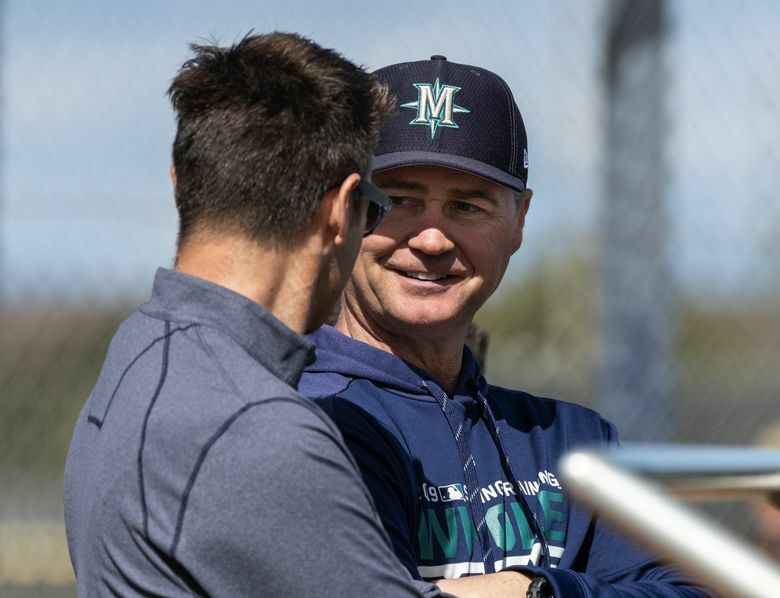 In mid-spring, Servais expressed delight in the Mariners’ vision of the future as exemplified by the young players in camp. It’s a tantalizing future the Mariners have forged for themselves. But to get there, you must first endure a turbulent present.